Manuel Garcia was born in San Pedro, California, in 1924. Both of his parents were Portuguese immigrants from Madeira Island in the Atlantic Ocean. His mother’s family settled in the Hawaiian Islands, and his father’s settled in California. 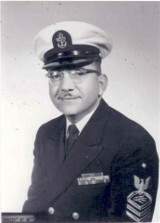 Mr. Garcia enlisted in the United States Navy in February 1941, at the age of seventeen and was a radioman striker on board the USS Argonne (AG 31) in Hawaii when the Japanese attacked Pearl Harbor on 7 December 1941. He retired from the Navy in 1963 and is an active member of the Pearl Harbor Survivors Association, Sacramento River City Chapter 6. I was sworn into the Navy on my seventeenth birthday in February 1941. While I was in boot camp in San Diego I took a series of tests, which qualified me for a number of schools. I wanted to be a quartermaster, but they put me in radio school whether I liked it or not. After I graduated from radio school in San Diego I was shipped out to the fleet in Pearl Harbor and assigned to the Commander Base Force, Flag on the USS Argonne, (AG 31). The USS Argonne was the flagship for ComBaseForce, under Rear Adm. William L. Calhoun. He was in charge of all the tugs, oil tankers, troop transports, and supply vessels–all the auxiliary ships. He was a line officer, not a combatant like Nimitz or Halsey. In other words, he commanded the logistics force of the Navy, and he did an outstanding job. The Argonne was built as a transport for the Navy in World War I. It was put in mothballs shortly after the war, then rebuilt around 1923 as a repair ship and returned to the fleet. We had a foundry and machine shops on board. The Argonne repaired tugs and smaller vessels, but also had the facilities for a large radio room. We had fifteen operating positions in there to handle all the radio traffic that a flag ship demanded. There must have been a couple of hundred thousand military people all around Oahu. I was fortunate, because I arrived on Oahu around September 1941, and on my first liberty I went into Honolulu and found my Aunt Clara, my grandmother, and my other relatives on my mother’s side. So there I was the first family member outside of Honolulu to come and visit them, and they made me feel at home. All the other servicemen would hang out on Canal and Hotel Streets and the Army/Navy YMCA. On 6 December 1941, I went on liberty and spent the evening at my Aunt Clara’s house. In the morning we got up and were getting ready to go to church. I was standing outside with my Uncle Ben and his three kids. We could see planes flying over Pearl Harbor. Then we started seeing smoke coming up. My aunt came out of the house and said, “The radio says the Japs are bombing Pearl Harbor, and for all military personnel to return to base.” So I ran into the house and put my uniform on, went down to the Black Cat Café, and caught the next bus out to the base. I ran through the shipyard to Pier 10-10, where the Argonne was. By that time, I could see that the Arizona had exploded, and some of the other battleships were smoking and damaged. The Oglala, the flagship of the mine force, was at Pier 10-10, and it had been hit and rolled over. The Oglala was alongside the Helena, which had also been hit. I went aboard ship and checked in with the O.D.–the officer-of-the-deck. He told me and several other sailors to take the canvas from over the quarterdeck and haul it down to the dock as a place to lay the wounded that were already being brought in. We had whaleboats and motor launches that were going over to Battleship Row and bringing back survivors. They were being handed up to the dock, then ambulances were taking them to either Tripler Army Hospital or the naval hospital. We got in the whaleboat and I told McCullum, “Kick it ahead.” We started moving and I drove it right up on the hull of the overturned Oglala. I told McCullum to cut the engine and we rolled off the Oglala. We tried it again and took off. We must have made four or five trips between Pier 10-10 and Battleship Row, picking guys out of the water. On one trip we pulled up alongside of the California. Most of the wounded had burns. Some could walk--most of them could. There were a couple who had to be carried. There was only one survivor of the many we pulled out of the water that sticks in my memory. There were a lot of guys swimming in the water. We pulled up to one and cut the engine. He reached up with his right hand and placed it on the gunwale, wanting to come aboard. I went to reach down and pull him aboard. I put one hand under his left arm and all the skin and flesh came off in my hands. He just looked at me–didn’t say anything. So I then reached way down to grab him by the belt and just yanked him into the boat. He hit the bottom of the boat and rolled over on his back. He still just looked at me, and most of the left side of his arm was gone. I looked at “Mac” and said, “Let,s get the hell out of here! We have to get this guy to the pier.” Like I said, I don’t remember the other guys we pulled out, but I can still see him looking up at me, and I have often wondered if he ever made it. All of this took place while the second of two waves of Jap planes were making their attack. The first wave had left by the time I got to Pearl Harbor. At one point, when I got back to Pier 10-10, that same officer with the jet-black hair and the .45 said, “Coxswain, take these three sailors to the Medusa.” The Medusa was a repair ship way out in the harbor some place. I didn’t know where it was, but by that time I knew how to handle that whaleboat. I could make that sucker turn around on a dime and give you change. After we dropped those three off at the Medusa, we came by the old battleship, Oklahoma. It had rolled over and the propeller shafts were out of the water by about three feet. My guess is that it was then close to noon. There was a motor launch there with cutting equipment aboard–acetylene torches and so forth, and they shouted for us to come over. They were on one side of the hull and had nothing to attach their motor launch to. We pulled up to the hull. They threw me a line and I climbed out onto the propeller shaft of the Oklahoma and secured it. Then some officers jumped out and they had blueprints of the Oklahoma. The hull was made from huge sheets of steel riveted together in rows, and they called those rows “frames.” They were counting the frames because on the underside of the Oklahoma there were large fuel and water tanks. Between the tanks there were areas between three and six feet wide, what they called voids–empty spaces. So what they were doing was counting frames so they could cut into these voids. There were something like seventy-seven or so men trapped inside and they could hear them making tapping sounds. I think only about thirty-two were brought out alive. What happened was, they got their burning equipment in there, cut a hole in one of the voids, and the fumes killed the men in there waiting to be rescued. So what they did after that was bring in a guy by the name of Joe Bulgo. He was Hawaiian and weighed about three-hundred lbs. He was a civilian worker from the shipyards, and he used a jackhammer like it was a chipping hammer. He used it to cut holes in the steel plates. Then he went down inside the hull of the ship and personally hauled out some of the thirty-two people who were still alive. I think it was in 1992 the survivors of the USS Oklahoma had a reunion in San Jose. There were three or four-hundred people there, and there were a few who had been among the thirty-two that Joe Bulgo had pulled out. There was also a guy there who did research for a movie that was going to be made about Pearl Harbor. He asked everybody there if any of them knew who the guy was who chipped away at the hull and pulled all those people out of there, but nobody seemed to know who the guy was. Then he said, “Well, how would you like to meet him?” Of course, everybody said, “Yes.” “Here he is right over here in a wheelchair. His name is Joe Bulgo.” And with that the whole reunion went into pandemonium, and of course everybody had to come over and meet him. This guy had never been recognized for what he had done–not so much as a pat on the back. It was quite an emotional ending for that reunion. Getting back to where I was, I think it must have been 9:30 or 10:00 at night when I came back in. Another officer had taken over as officer of the deck, and I told him that I had been out there all day and that I had the midnight watch in the radio shack. When I went back aboard the Argonne all I had on was my jockey shorts--no shoes and no T-shirt, and I was covered in oil. I have had people ask me if I was ever scared. I don’t think I was ever scared, except when I pulled that one guy out of the water–that affected me. I think the training I received took over from my personal emotions. But when I stepped outside on Monday morning and saw what looked like our entire Navy destroyed, I wanted to cry.